This is a collection of 19 fantastic quilt designs from some of the world's most popular quilters. 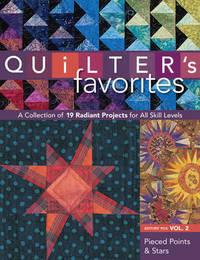 It includes quilts from: Alex Anderson, Carol Doak, Jean Wells, M'Liss Rae Hawley, and many more. Hand-picked by the editors at C&T publishing, this volume brings together a collection of more than 19 stunning quilt designs featuring points, peaks, and spikes. Featuring both traditional and paper-piecing patterns, from some of the biggest names in the industry - including Alex Anderson, Piece O' Cake Designs, and Carol Doak - "Quilter's Favorites" has something for everyone.